Publish 97 - Live World Wide - New pet revamp, Train pets in special abilities and also new tameables. 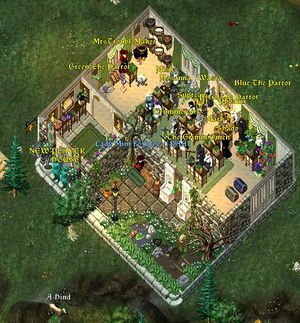 New UO ICQ Chat Room - Talk to complete strangers about UO! See more in the UO News Archive. On January 16 and 17, a pair of tournaments were held. The Atlantic: 2016 Winter Classic 1v1 PVP Mage Tournament and Atlantic:_2016_Winter_Classic_2v2_Team_Tournament. What would you most like to see in the new Expansion - Time of Legends? See previous poll results in the poll archive. The New Player House is built by Mim Foxglove to provide inspiration and encouragement for the young ones. It was built the first day housing is allowed in Trammel. It is located south of Trinsic public gate, the first house to the south. 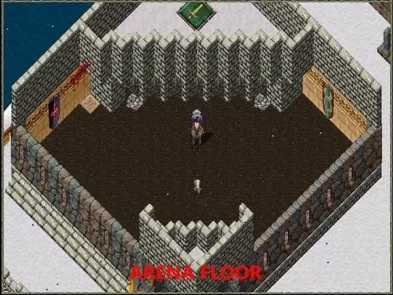 The house is full of information for new players, basic things and links to good places for more in-depth information. Also items new players need to know about are displayed and often examined. If you have some gold you can buy a cheap good armor. If you don't have gold you can ask for a free set and weapon of decent quality, or a mage suit. You can learn something about skills and templates from the guides written by Veteran players of Europa. If you are not new you are welcome anyways to have a look and maybe some opinions. 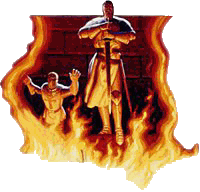 If you like what we are doing, help us to direct the new players here! See more in the Featured Establishments Archive. 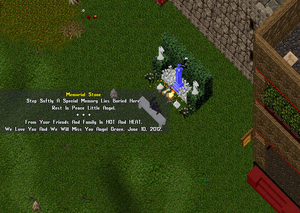 A memorial to Angel Grace, a player from the Atlantic Shard. See more in the Featured Screenshots Archive. This page was last modified on 8 October 2016.